The Cruise management team from left: COO Dan Kan, President Kyle Vogt and CEO Dan Ammann, the former president of GM who moved to Cruise on Jan. 1. DETROIT -- General Motors spent much less than it expected last year on its GM Cruise autonomous vehicle operations. As part of its 2018 earnings report Wednesday, GM said it spent $728 million on the business vs. the roughly the $1 billion it had forecast. CEO Mary Barra attributed the lower expenses in part to "incredibly good cost controls" by former Cruise CEO Kyle Vogt, who became the unit's chief technology officer Jan 1. Former GM President Dan Ammann succeeded Vogt as CEO. "Kyle Vogt is an excellent leader and manager, and he spends every dollar like it is his own," Barra said during a call with investors. Other factors may be that GM didn't begin testing its autonomous vehicles in New York City in 2018 as expected, and that plans to deploy a fourth-generation vehicle without manual controls have stalled pending regulatory approvals. A GM spokesman said the lower spending was due to "nothing unusual" and that Cruise is "focused on acquiring talent and making progress on its plan." It has been more than a year since GM petitioned NHTSA, the nation's top safety regulator, for permission to deploy self-driving vehicles that don't have manual controls such as steering wheels and pedals to operate on U.S. roadways, and get around 16 requirements under Federal Motor Vehicle Safety Standards that cover vehicles with human drivers. 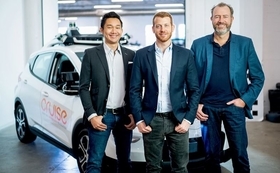 Barra said Wednesday that there was no update on that petition, which the company was hoping to have approved for its plans to launch an autonomous ride-hailing fleet in 2019. She said the company is "in good position" and capable of launching the service with its third-generation vehicles, which have manual controls. Barra affirmed that safety would be the company's guiding principle for launching the fleet. The ride-hailing service is expected to start in San Francisco, where Cruise has its headquarters, though that hasn't been confirmed. For 2019, GM again expects to spend roughly $1 billion on Cruise, CFO Dhivya Suryadevara told investors Wednesday. Cruise has expanded its work force from dozens when GM acquired the company in 2016 to more than 1,100, Barra said.